With our Sugar Grove Sugar-Cured Country Ham, Sugar Grove Ham Co. is preserving the rich heritage of slow curing quality hams that has delighted the taste buds of families for generations. Sugar Grove Country Hams is centered in Taylorsville and Boone, North Carrolina. From the farm to the ham house, located in a scenic mountain valley just north of Sugar Grove, North Carolina, great care is taken in selecting the choice hams and ingredients that make up our authentic brown sugar cure. The select ingredients of our special dry cure are applied by hand to each individual ham. 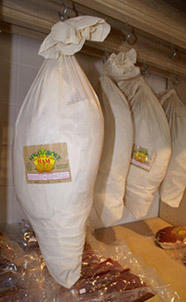 After absorbing the cure the hams are removed from hardwood curing racks, individually wrapped in kraft paper, and carefully hung from the rafters in cotton cloth bags to begin the aging process in a climate controlled environment. They remain there throughout each of Mother Nature's seasons while developing the wonderfully distinctive flavor of a slowly cured and perfectly aged Sugargrove Sugar Cured Country Ham. Our hams are the only ones with USDA inspected approval. Click here to connect to our Sugargrove Ham Online Store. 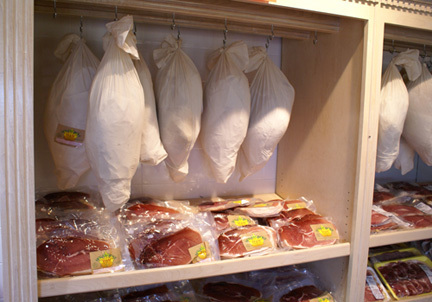 We can ship these custom cut & climatic cured ham products anywhere in the continental USA. Copyright © 2019 Mays Meats.